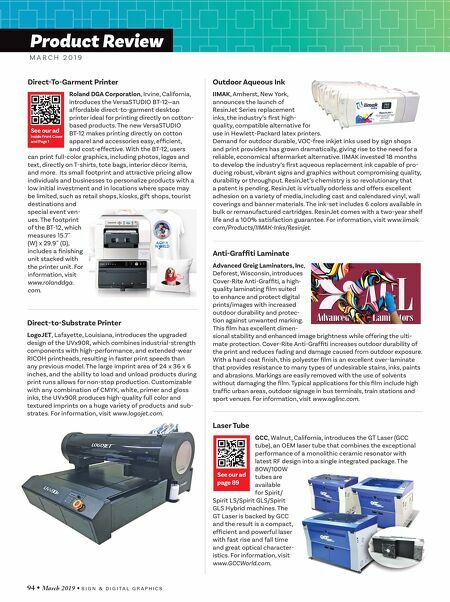 S I G N & D I G I T A L G R A P H I C S • March 2019 • 95 Dye-Sublimation Ink Mutoh America, Inc., Phoenix, introduces a new Mutoh Manufactured ink "DH-21" for select Dye- Sublimation ValueJet printers. DH-21 is a cost- effective, high load per- formance ink designed to achieve high-density colors with less ink consumption while providing superior color rendition with reduced metamer- ism. Its fast drying formula enables print- ing on thin and light papers while minimiz- ing transfer times. The ink is available in four colors (CMYK) in 1000ml bags with an 18-month shelf life. It is compatible with ValueJets 1948WX, 1638WX, 1938WX and 1624WX. It is now available for sale through authorized Mutoh resellers across North and Latin America. For information, visit www.mutoh.com/dealers. 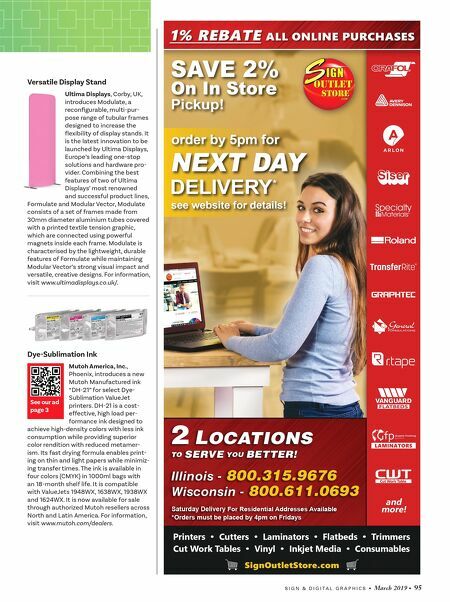 See our ad page 3 Versatile Display Stand Ultima Displays, Corby, UK, introduces Modulate, a reconfigurable, multi-pur- pose range of tubular frames designed to increase the flexibility of display stands. It is the latest innovation to be launched by Ultima Displays, Europe's leading one-stop solutions and hardware pro- vider. Combining the best features of two of Ultima Displays' most renowned and successful product lines, Formulate and Modular Vector, Modulate consists of a set of frames made from 30mm diameter aluminium tubes covered with a printed textile tension graphic, which are connected using powerful magnets inside each frame. Modulate is characterised by the lightweight, durable features of Formulate while maintaining Modular Vector's strong visual impact and versatile, creative designs. For information, visit www.ultimadisplays.co.uk/.